Today 45.000 Baga people, live along the coast of Guinea Bissau. The Baga people had rich traditions of multifunctional masks and sculpture, many of which were suppressed with the advent of Islam. 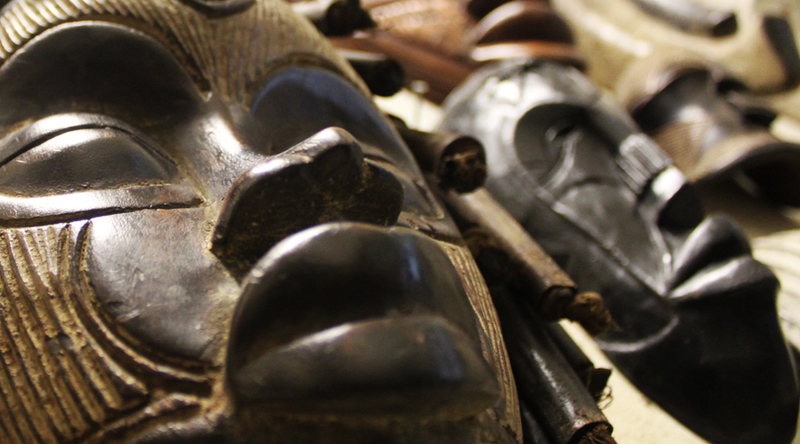 The best known of these is the massive Nimba (or Dumba) mask, with its great cantilevered large nose, a large pair of breasts, crested head supported on the upper part of a female torso, carved so as to rest on the shoulders of the wearer, his body hidden in raffia fiber. Sterile women in the Simo secret society invoked it as the Mother of Fertility, and it was used at the first-fruit (rice) rituals, symbolically associating female fertility with the increase of the grain. This mask appears at the harvest and threshing of the rice crop, is worn by dancers at birth, marriages and other joyful ceremonies. This mask represented the very essence of Baga dignity and culture. The Simo society utilized very large polychrome masks (often more than 5 feet tall), known as banda or boke which are used in fertility rituals by this society, played a part during the dry season, after the rice harvest, and at funerals. It has an elongated human face with the jaws of a crocodile, the horns of an antelope, the body of a serpent and the tail of a chameleon.